Stingray Fishing Charters offers several charter packages tailored to suit your individual needs. We offer over night, and one day charter packages that can accommodate up to 6 people. • Please Bring your own food and beverages, We have all the utilities needed to cook your food. 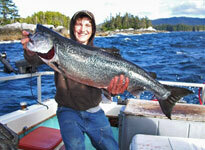 We at Stingray Fishing Charters will supply the food for $100.00 extra a day. • For overnight charters please bring your sleeping bag and pillow. • You should also bring a camera or video camera, shorts, sunglasses, suntan lotion and rain gear including rubber boots - Just in case. • Salt Water Fishing Licenses are required. • Please book well in advance to ensure the availability of the dates you would like to fish. We accept Cash, Money Orders and Cheques. 50% payment is required at time of booking. A once in a lifetime fishing adventure!